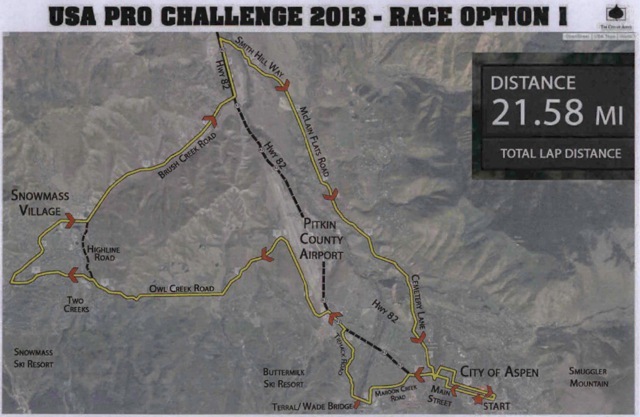 This map of the proposed route for the USA Pro Challenge bike race on Monday, Aug. 19 was presented to the Pitkin County commissioners on March 12. It does not show the exact route through the Brush Creek Village subdivision or the direct crossing of SH 82 to Smith Hill Road. While Pitkin County’s special events committee still needs to approve a permit for the USA Pro Challenge bike race in August, the county commissioners on Tuesday signed off on a proposed 22-mile route for the circuit between Aspen and Snowmass Village. All five commissioners said they were now comfortable with the route of the first of two races, which are to be held on Monday, Aug. 19 and Tuesday, Aug. 20. “This is a fabulous thing for our community,” said Commissioner Rob Ittner, who said the press had made it sound like the commissioners didn’t support the race. He said it was more the case that the commissioners have a duty to review public safety and community-access aspects of the race course. In January the commissioners had expressed concerns about how residents, motorists and public safety vehicles would be hampered by the race. “There will be some restrictions on movement that day,” Chuck Hodge, the technical director for Medalist Sports, the Atlanta-based organizer of the race, told the commissioners Tuesday. While Hodge said the course was designed to avoid Highway 82 as much as possible, the race will likely still cause delays of up to 20 minutes on the state highway between 12 and 4 p.m. on Aug. 19. And some residents may need to wait 10 to 15 minutes to get safely out of their driveways during the race, Hodge said. The commissioners had little comment yesterday on the second of the two proposed races, which will have cyclists leaving downtown Aspen on Aug. 20 and heading over Independence Pass to a finish in Breckenridge. The race on Aug. 19 is more complex, however. The route, which riders will complete three times, starts on Main Street in Aspen and goes through the roundabout and up Maroon Creek Road to the pedestrian bridge that connects to Tiehack Road. At the bottom of Tiehack Road, racers will use the upvalley lanes of Highway 82 for a short distance until they get to Owl Creek Road. At the upper end of Owl Creek Road near the fire station in Snowmass Village, the racers will turn right down Brush Creek Road and then just above Highway 82, they will turn left on to Medicine Bow Road. The racers then will take a low route across the Brush Creek Village subdivision on Upper Ranch Road to Juniper Hill Road before crossing Highway 82 to Smith Hill Road and McLain Flats Road. From there, the course goes up Cemetery Lane, turns down Power Plant Road, through the West End and back to Main Street, where the finish line will be set up. Hodge of Medalist Sports said cutting across the bottom of Brush Creek Village will avoid a steep hill climb and help keep the racers closer together, which will make it easier for traffic to proceed through gaps in the race. Hodge said the proposed course is just under 22 miles long and racers will complete each of three laps in about 50 minutes, with the actual racing taking place between 12:30 and 3:45 p.m.
Capt. Rich Duran of the Colorado State Patrol told the commissioners that state troopers could handle any resulting traffic back-ups on the highway. And he said troopers could also effectively manage traffic at the dangerous intersection of Smith Hill Road, Juniper Hill Road and Highway 82. “I don’t really see a huge issue with traffic safety there, just because we’ll have so much staff on board to make sure that the cyclists can get through that area safely and in turn make the travel for the motoring public safe,” Duran said. The city of Aspen and Medalist Sports are now expected to apply for a special use permit from the county, and the application is not expected to come back before the commissioners. During Tuesday’s work session discussion the commissioners also heard from planning consultant Tom Newland who has been retained by the city. Newland has met recently with a long list of local homeowners associations about the race, as well as officials at the hospital, the airport and RFTA. “We really didn’t hear any negative things,” Newland said. Newland said concerns included access for construction crews working on homes, delays for someone landing at the airport without knowledge of the race, and race fans illegally parking on subdivision roads. Spectators will be encouraged to ride their bikes to places along the course, such as the bike path that parallels Owl Creek Road, said Nancy Lesley, the city’s director of special events and marketing. On Tuesday, Pitkin County Sheriff Joe DiSalvo said that public safety vehicles will have complete priority over the race. And he pointed out that the law enforcement and public safety presence needed for the race will actually increase response time in an emergency. DiSalvo said last year an ambulance was able to quickly reach a heart-attack victim near the top of Independence Pass during the race and the rapid response likely saved the person’s life. Jim Burrell, the president of Medalist Sports, said that a helicopter will be used to broadcast live images of the race. It will be hovering 1,000 feet above the course for the last two hours of the circuit. Race organizers also said they held a meeting with U.S. Forest Service officials on Tuesday morning to discuss camping regulations on Independence Pass for the Aug. 20 race, but they do not expect camping to be an issue on the route between Aspen and Snowmass.